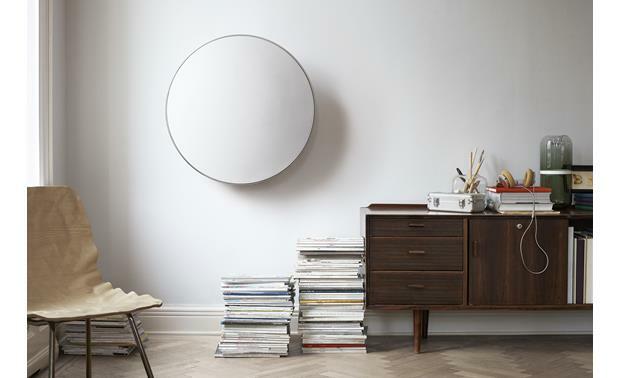 The Bang & Olufsen Beoplay A9 powered speaker makes a dramatic addition to your room's décor — and fills it with magnificently spacious sound. This stylish speaker also lets you enjoy music from just about any source. The A9 has built-in Bluetooth, plus several kinds of Wi-Fi streaming, including Spotify® Connect, Apple® AirPlay®, Chromecast built-in, and DLNA. And the A9 can be part of a Beoplay multi-room audio system for even more listening options. You can wall-mount the Beoplay A9 and make a bold design statement. The Beoplay A9's five built-in speakers produce a clean, balanced sound. A pair of 3/4" tweeters deliver clean, clear highs, with two 3" full-range drivers for detailed midrange. An 8" woofer effectively fills out the bass frequencies. Class D amplifiers ensure accurate sound reproduction. Built-in Bluetooth 4.0 lets you stream high-quality sound from your smartphone or tablet. Built-in Wi-Fi® connects the Beoplay A9 to your home network and the internet. Own an iPhone®, iPad®, Apple Watch® or Mac®? The A9 has built-in Apple AirPlay®. You can even use your Apple Watch to control the system. Bang & Olufsen Beoplay gear uses Chromecast built-in to create a multi-room wireless audio network. Download the free Beoplay control app from either the Apple App Store or Google Play to start. The app lets you remotely control your A9, as well other Beoplay speakers in your home. 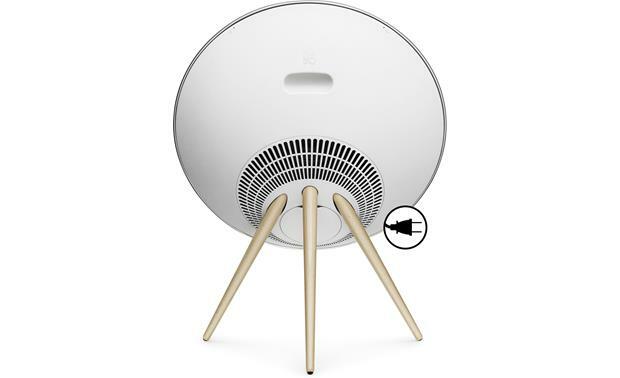 The Beoplay A9 speaker system rests on three sturdy solid wood legs. Remove them, and you can mount your A9 on the wall. It's almost like hanging art. The custom-designed fabric has a rich, luxurious appearance that can make it a focal point for your room. The speaker's exterior has touch-sensitive controls — simply tap it to turn it on. The Beoplay A9 is also compatible with Roon, a subscription digital music player you download to your smartphone, tablet, or computer. It gives you multi-room audio playback for all your Chromecast-compatible devices and more. Roon accesses your digital music collection from your iTunes library or NAS drive. It also works with your TIDAL subscription. Roon lets you do deep dives into your music, showing artist bios, photos, reviews, and lyrics. Roon can also suggest other artists and songs based on your selections, making it easy to discover new music you'll enjoy. 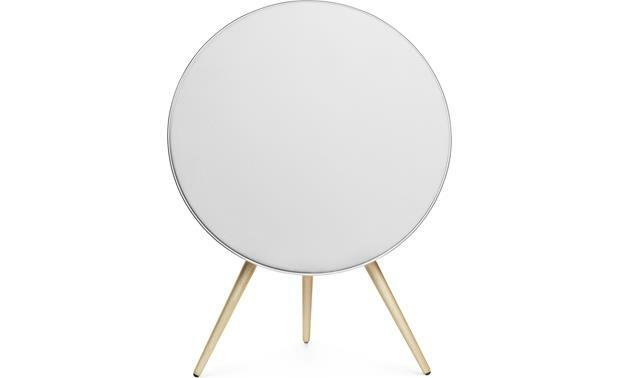 BeoPlay A9: The B&O BeoPlay A9 is a wireless powered speaker that can function as a standalone speaker system or be connected to other BeoPlay speakers (sold separately) across multiple rooms. It offers Band & Olufsen's signature sound with wireless connectivity for Chromecast, AirPlay, DLNA, and Bluetooth. The A9 is designed and crafted like a beautiful piece of furniture with a careful selection of materials and a great attention to detail. Three-Way Speaker Design + Class D Amplification: The BeoPlay A9 wireless speaker system features a three-way driver design with two 0.75" tweeters, dual 3" midrange drivers, and one 8" bass woofer. The BeoPlay A9 uses Class D amplification to power the system. The two 0.75" tweeters are powered by a 80W x 2ch Class D amplifier, the dual 5" midrange drivers are also powered by a 80W x 2ch Class D amplifier, and the single 8" woofer is powered by a 160W x 1ch Class D amplifier. 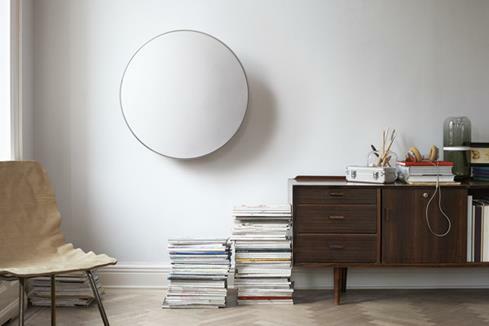 Note: To optimize the sound performance of the BeoPlay A9, you can indicate the placement of the A9 in your room. This is controlled manually on a switch placed on the back of the speaker. 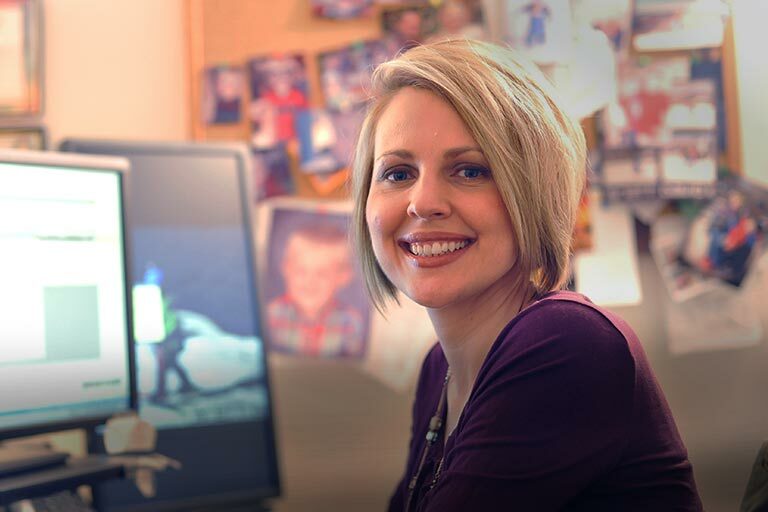 Choose from 3 predefined settings - Wall, Free, or Corner. Wired or Wireless Network Connection: The BeoPlay A9 provides wired and wireless connectivity to your home network. It has a RJ-45 Ethernet jack for its wired connection and features built-in WiFi for a wireless connection. The built-in WiFi supports 2.4GHz and 5GHz (a/b/g/n) networks. Chromecast Built-In: Chromecast Built-in lets you instantly stream select music apps from your Apple iOS or Android mobile device to the BeoPlay A9 speaker system. Unlike Bluetooth, Chromecast Built-in works over WiFi so you can connect more than one device to the A9 speaker system at a time and control what's playing from anywhere in the house on your mobile device. Because the music apps are streamed from the cloud, you get crystal clear sound and your mobile device's battery won't drain as fast compared to Bluetooth. Supported Content: Chromecast Built-in offers Internet Radio apps like TuneIn & iHeart Radio; plus online music service apps like Pandora, Spotify (requires Premium subscription), Google Play Music, and more. 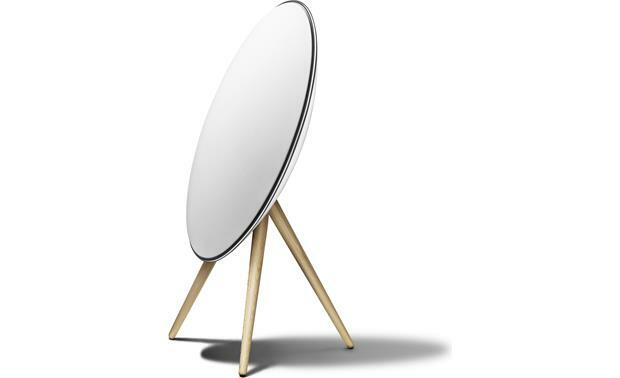 You can even mirror exactly what's playing on your Android phone or tablet to the BeoPlay A9 speaker. Or, if you're on your laptop or computer, you can also cast any music streaming website through the Chrome browser. Simple-to-Use: Simply tap the Cast button from a Chromecast Built-in compatible music app to start streaming to the BeoPlay A9 speaker. You can even adjust the volume or change the song, right from your mobile device. And with Chromecast built-in, you can keep using your phone to send texts, answer calls, and scroll through social media without disturbing your music. Voice Control (Optional): Purchase the Google Home Wireless Speaker (8064658762, sold separately) and gain voice control of compatible Chromecast Built-in music apps. You'll be able to access a specific music app and then select a specific station or song using only your voice. You'll also have voice control over Play, Pause, Skip, & Volume. The BeoPlay A9 & the Google Home Speaker must be connected to the same wireless (WiFi) network. Note: Chromecast Built-in is a cloud based function and requires that the BeoPlay A9 and your Apple iOS or Android mobile device are on the same wireless network, and have access to the Internet. DLNA: The BeoPlay A9 is DLNA compliant for playback of various music files (MP3, AAC, FLAC, & WAV) stored on your Windows PC or DLNA-certified NAS drive connected to your home network. Use the BeoMusic app on your Apple iOS or Android device to access these music files. MAC OSX computers and laptops require third party software to be visible on the network (Twonky, Plex, Servio etc.) as they do not support DLNA. DLNA works with multiroom distribution through the BeoPlay app. 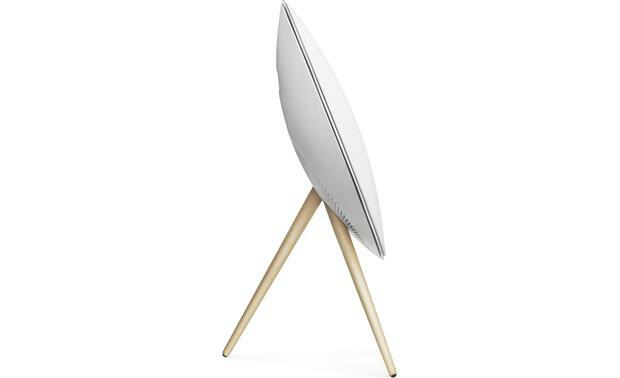 Apple Device Connectivity: The BeoPlay A9 offers Apple device connectivity via AirPlay & USB. AirPlay: AirPlay lets you wirelessly stream music directly from your Apple iOS device (running iOS 4.3.3+) or from your iTunes library on your Windows (XP-up) or Mac computer (running iTunes 10.2.2+) to the BeoPlay A9 speaker system, over your home's WiFi network. By downloading Apple' free Remote App onto your iPod touch, iPhone, or iPad you don't even need to be in the same room as the speaker or your computer to play, pause, skip, and stop the songs in your iTunes music library. AirPlay can be enabled to work with multiroom distribution through the BeoPlay app. AirPlay requires that the A9 and your Apple iOS device or computer are on the same wireless network. Apple Certified USB Port: If you prefer a hardwired connection, the BeoPlay A9 is fitted with a USB (type-A) port for your Lightning connector Apple iPod, iPhone, and iPad. While connected, you can listen to stored music and music apps on your compatible Apple device while its battery is charging. Bluetooth 4.0: The BeoPlay A9 offers built-in Bluetooth 4.0 with support for wireless music streaming (A2DP). You'll be able to stream stored music and music apps from your Bluetooth-enabled Apple iPod/iPhone/iPad, Android smartphone/tablet, Windows PC/Phone, Mac computer/laptop and more to the BeoPlay A9 speaker system. Basic playback control, such as Play/Pause & Previous/Next Track can be done from the speaker's top-panel controls. The speaker can pair with up to 8 devices, but only one device can be used for playback at a time. Once paired, the A9 will automatically re-connect with your device when in wireless range (up to 33'). Bluetooth can also be distributed to multiple BeoPlay speakers (sold separately) that support multiroom distribution through the BeoPlay app. Aux Input: The BeoPlay A9 is fitted with a stereo RCA auxiliary input for connecting an external audio device with an analog output. The Aux input even supports multiroom distribution through the BeoPlay app. Sensor Controls: Simply swipe your hand across the top sensor to turn volume up or down. Rest your hand on the top sensor for a few seconds to mute sound. Tap to the right to play next track and left to play previous track. Short tap in the centre initiates the last played source. 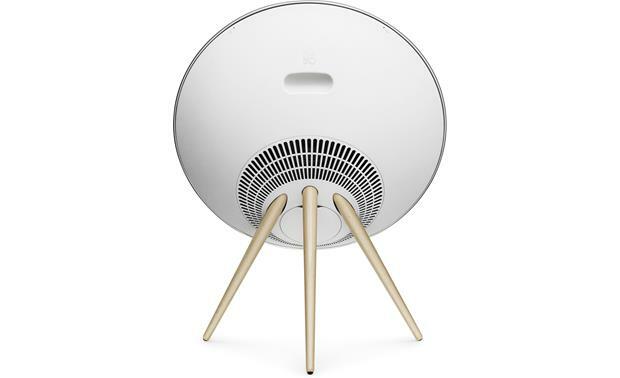 Mounting Options: The BeoPlay A9 includes three wooden legs to place the speaker on the floor or a table-top. You can also purchase the optional wall-bracket (sold separately) and hang the BeoPlay A9 on the wall. When you mount BeoPlay A9, you must also set the position switch correctly. The position switch influences the soundfield around the BeoPlay A9. When you mount BeoPlay A9 on the wall bracket or place it closer than 3' from a wall, you must set the position switch to position "Wall". When you place the BeoPlay A9 in a corner closer than 3' from the walls, you must set the position switch to "Corner". When the BeoPlay A9 is placed more than 3' from a wall, you must set the position switch to "Free". Carry Handle: An integrated carry handle lets you move the speaker from room to room, though it is not battery powered and requires an AC power outlet connection. Power Requirements: The BeoPlay A9 wireless audio speaker system comes with a 58" detachable AC power cord which must be plugged into an AC wall outlet, surge protector, or power conditioner. 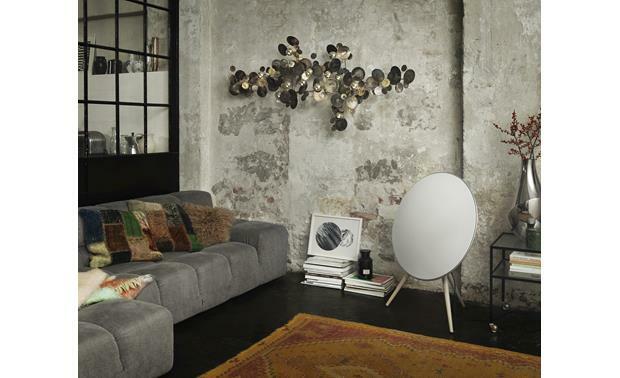 Searches related to the Bang & Olufsen Beoplay A9 Powered speaker with Wi-Fi® and Bluetooth®.